Ever used Kayak, the travel search engine? Unlike all the individual airlines’ and hotels’ sites, it pulls together tons of info and lets you sort and filter them the way you want. Well, one of their top people, Pablo Gravier, left a couple of years ago and is now doing TrialReach. Eighteen months ago they asked me to be an advisor, and I said yes. Last month I visited them in London for the first time, and was very very happy to see what they’ve created. They’re doing something far more difficult than travel search, and far more important: gathering information about clinical trials, expressing all the scientific stuff in human-readable terms, and presenting it to patients who want to get involved. We already have clinical trials sites that simply list the raw facts – e.g. ClinicalTrials.gov. But I can’t tell you how many people have told me what a slog it is to find what you need there. 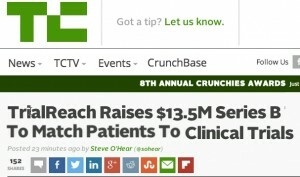 “…another way to think about TrialReach is that it is building a meta search engine for clinical trials. That makes even more sense when you consider that co-founder and CEO Pablo Graiver — who tells me he’s made 10 trips to the U.S. in the last 12 months — was previously VP Business Development Europe at travel meta search engine Kayak. Well and truly out of the bag, indeed. Power to the people – the people who need it – and here’s to blending modern technology with sociological challenges.